Spruce up your receipts! QuickBooks Mobile Payments lets you send an email or text message receipt, both of which show customers your contact information. You can customize mobile payments receipts to show exactly the information you want customers to see. To customize your receipt, from the GoPayment app menu, tap Settings. 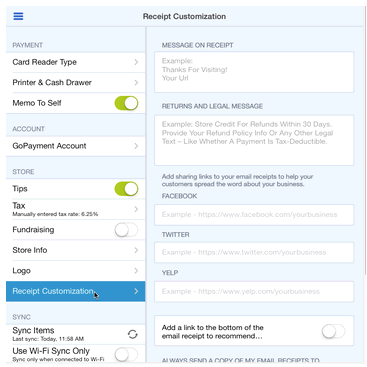 Complete the fields to customize your receipt. You can add a thank you message, a return policy, or add clickable links to emailed receipts for your web site or Facebook page. Note: If the changes will not save, it may be due to special characters. If you have special characters in a field, try removing them and saving again. To add a logo to your receipts, under Store settings, tap Logo. Go to the online service center. Click the Home tab in the blue bar at the top of the screen. Click the Manage Mobile Payments button in the Shortcuts section towards the center of the screen. Choose Customize Receipt from the right-hand Quick Links menu. Update your information and click Save & Preview Receipt. NOTE: If you receive the error: You can't upload a logo at this time. Try back later, then you will need to upload your logo using the GoPayment app as instructed above.